Looking for a Thanksgiving craft to keep the little ones busy while you cook this year? Or maybe you’re looking for a cute craft you can do together to help decorate your home. Look no further. 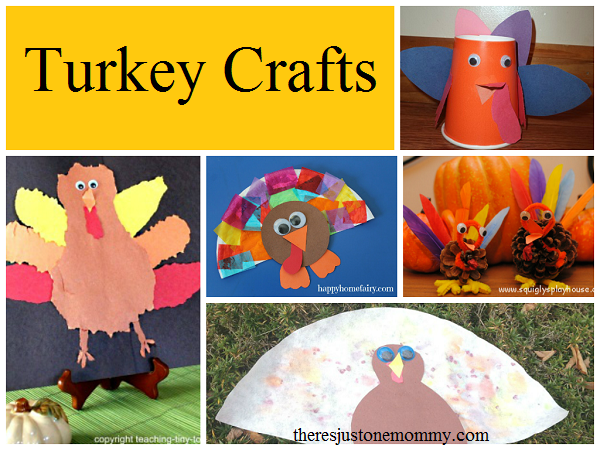 Here are 10 simple turkey crafts for kids that your child will love. Paper Cup Turkey — This simple turkey craft is perfect for toddlers and preschoolers. It makes a cute centerpiece, or make several to use as place settings. Tear Turkey — Kids can work on fine motor skills while tearing paper in this idea from Teaching Tiny Tots. Preschooler Turkey with Beans — Your child will be working on fine motor skills while creating this colorful turkey. Collage Paper Plate Turkey — Your child can show off their own unique personality with this simple craft. Pine Cone Turkey — Pine cones are always fun to use when making turkeys. I love this one from Squigly’s Playhouse. Turkey Hat — Little ones will love this silly hat idea from Crafts-N-Things for Children. Handprint Turkey — If you love handprint crafts, then you won’t want to miss this one that is perfect for Thanksgiving. I still hang up the ones my kids made years ago — love those little hand and footprints! Candy Science Turkey — Use science to create a colorful turkey. Family Hand Print Turkey — Use everyone’s handprint to make this turkey from Family Corner. Paper Plate and Tissue Paper Turkey — Here is a colorful idea from Happy Home Fairy. These turkey crafts for kids are sure to get your home ready for the holiday. Thanks so much for the link up to my Thanksgiving Day craft! Much appreciated. Happy belated SITS day to you! I hope it was everything you wished it to be. What great craft ideas! I love the sandwich! Sometimes an edible craft is just what is needed! That turkey sandwich is cute, cute, cute! Love these ideas. I’m in Canada and Thanksgiving has long since come and gone and I think I’m STILL going to do these things-super cute! !